All Aboard the Alphabet Train! Pin or frame a large piece of white felt to the wall in your kid's room and let them choo-choo-choose how to build a fun and colorful felt alphabet train to spell their name and lots of other words. Felt lightly sticks to itself, even when hanging vertically on the wall, so you can easily move the pieces all around to make your trains and everything will stay put until you're ready to move things around again. Cut 26 rectangles from felt, one for each letter of the alphabet. Cut the front of one longer rectangle at an angle to use as the train engine. 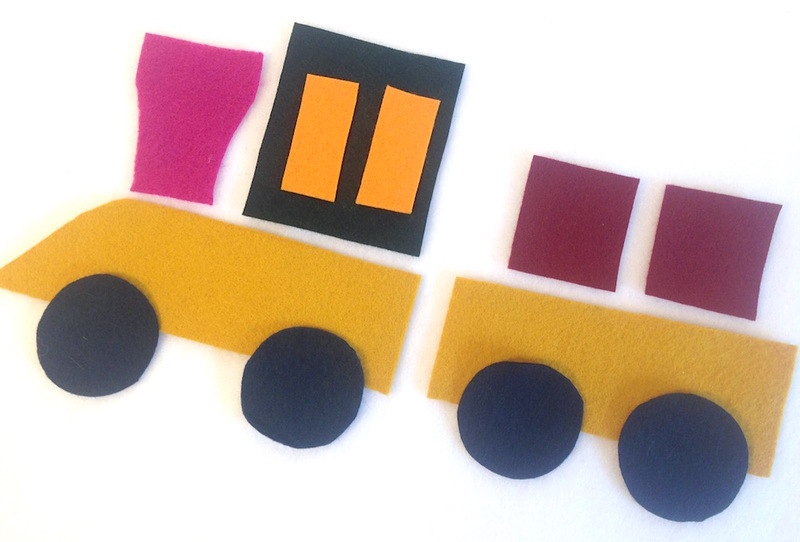 Cut 52 felt circles for wheels, plus a variety of different colored squares, rectangles and triangles for the cargo. Trim shapes as shown for the engine's cab and smokestack. If you are using wool felt, you can iron on a Joy letter to each train car, following the instructions on the letters' packaging. If you are using synthetic felt, gluing the letters would be better, since some synthetic felts can melt in high heat. 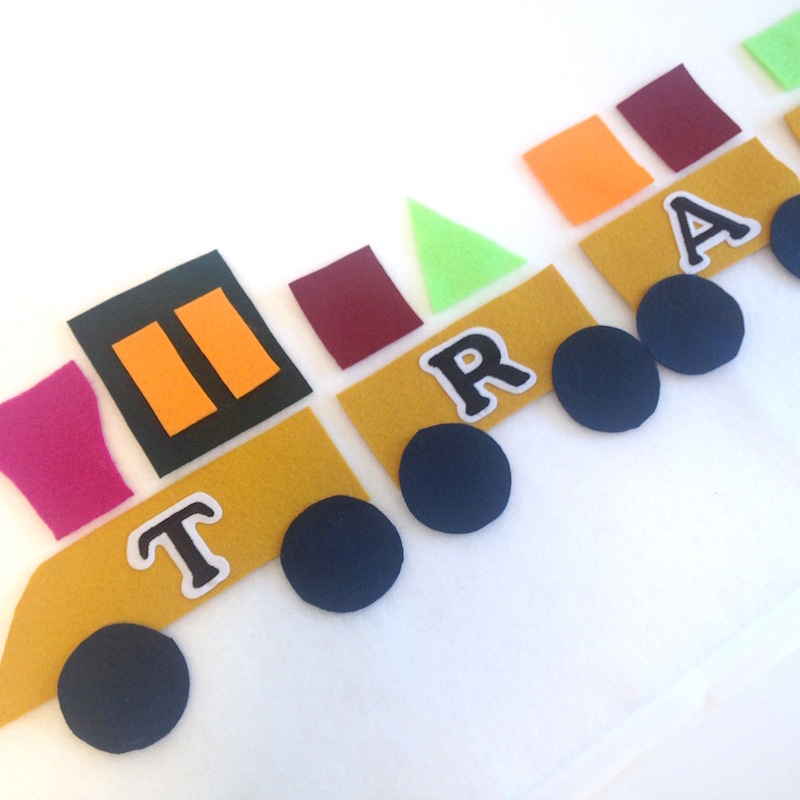 This fun felt alphabet train is not only easy to make (and it looks really cute hanging on the wall), but it's also a creative way to help your kids use their imagination and learn their letters, shapes and colors. 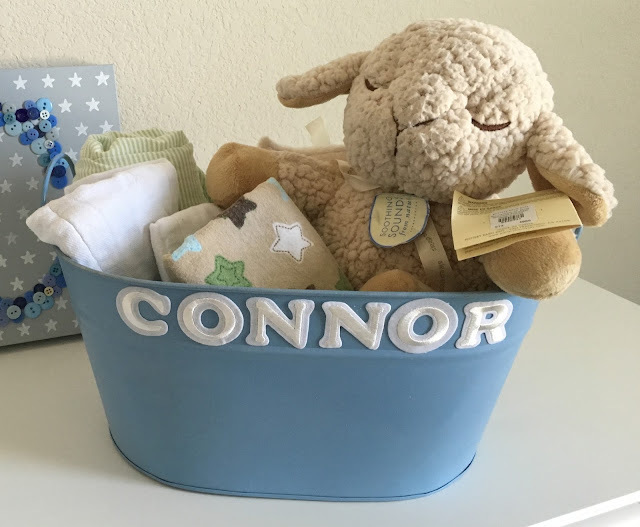 I've been working on projects for my grandson Connor's nursery. I started with the letter "C" written in shades of blue buttons, glued to a painted gray canvas with white stars. Then I spelled his name in small wood letters on painted blocks. Really cute, but we needed more! My daughter-in-law found a galvanized metal bucket at a local yard sale, perfect for all kinds of baby knick-knacks. We wanted to add his name to that too, but wood letters didn't work too well on a curved surface, so it's Joy to the rescue! 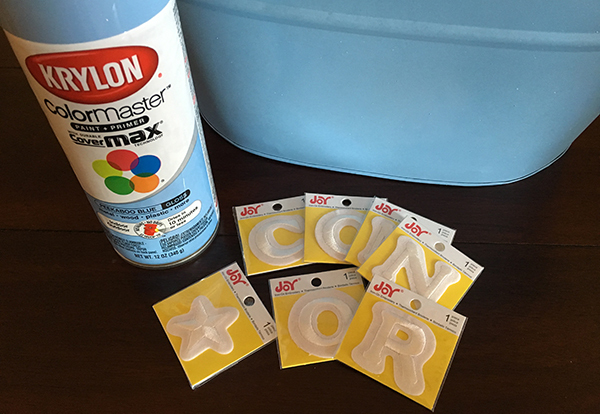 Supplies were minimal - all you need are Joy embroidered letters and Krylon® Spray Paint. 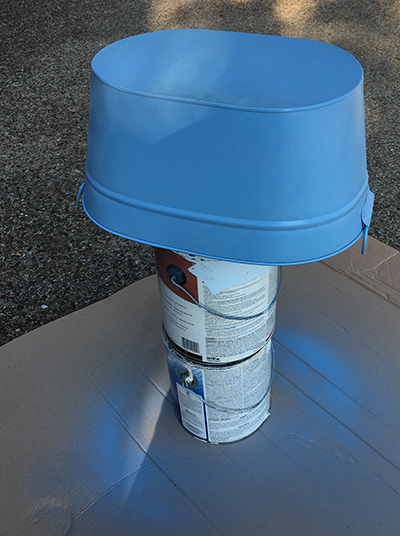 Step 1 - Paint the bucket. I turned it upside down over a tower of paint cans then lightly sprayed the outside with 2-3 coats of blue. The paint dried really quickly, so it only took about 10 minutes, then I sprayed the inside. Step 2 - Peel the waxy paper backing off of each letter to expose the adhesive then place around the rim of the container. TIP: For names with an even number of letters, mark the center of the container's rim and adhere the last letters of the name on the right, then add the first letters to the left. If your name has an odd number of letters, place the middle letter over the center mark first. These letters worked perfectly on the curved rim! Seriously, how cute is this? 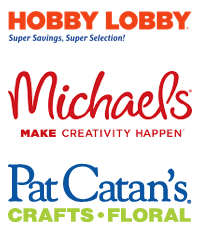 in a variety of colors, sizes and fonts at your local craft store. Enjoy! To keep yourself cool (and looking good!) 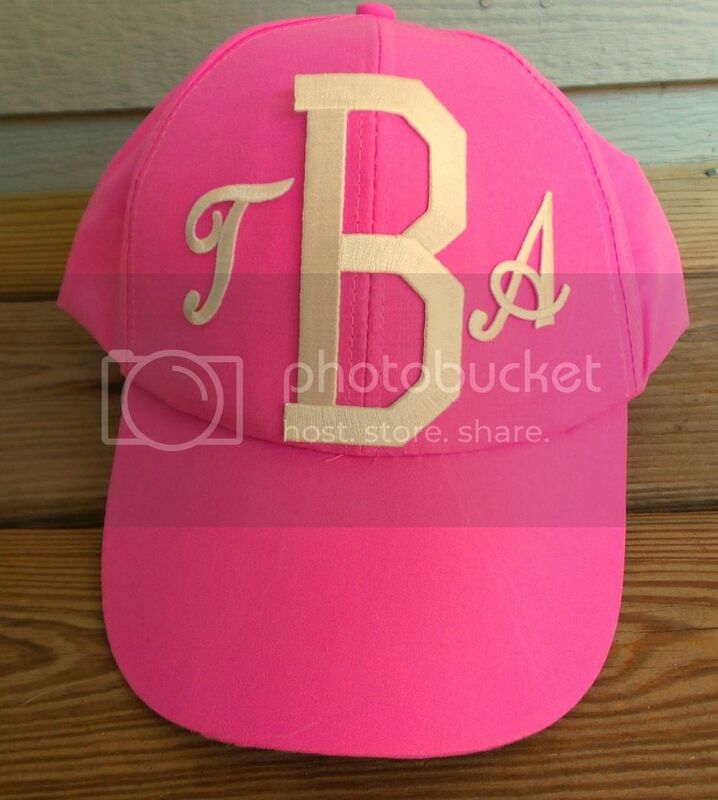 during this super-hot summer, personalize a baseball cap with your monogram. Here in the South where I live, monograms are all the rage. You see them everywhere - on purses, clothing, you name it! So I decided to get in on the monogram craze, but I didn't want to pay those high prices for machine embroidery. JOY iron-on embroidered letters to the rescue! I found a plain pink baseball cap at my local dollar store. I then ironed on a combination of block and script letters to create a fun and bold monogram. I now have the look of machine embroidery for much, much less! Years ago, we put all our movie DVDs into soft, black cases like these to cut back on shelf space. But over time, they got mixed up with the same kinds of cases filled with music CD's. I finally went through and reorganized our whole collection and labeled the cases using Joy letters and some strong clear glue. The "Educational" case consists of nature, historical and instructional DVD's. 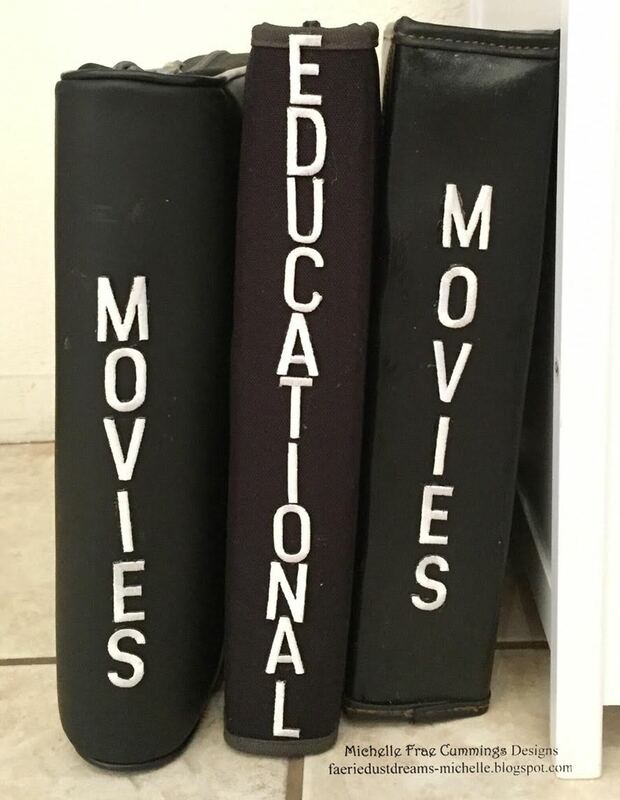 The other cases hold movies and TV shows. I also placed a piece of white tape on the front of each binder and wrote what was inside, depending how I alphabetized the discs. 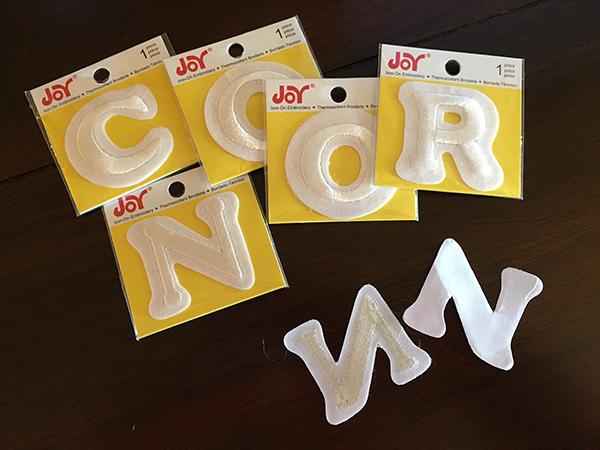 You can find your favorite style and color of Joy letters at your local craft store! I love making pillows. 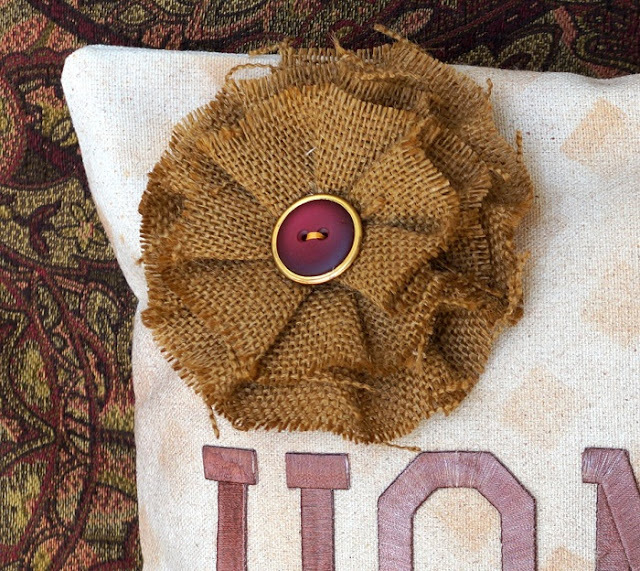 Especially when it's a quick and easy "no sew" pillow! For this project, you need a 12" plain canvas pillow cover, an all-over patterned stencil, spray inks and large iron-on embroidered letters from Joy. Using removable painter's tape, I taped the stencil onto the canvas pillow cover. I wanted my pillow to have a subtle background, so I lightly sprayed the canvas with a pale, shimmery color. Because the pillow is decorative, I'm not worried about the spray being non-washable. 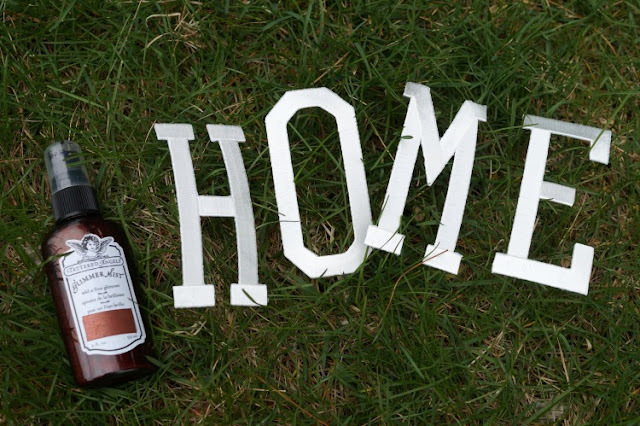 I used large iron-on letters from Joy to spell out the word "Home." To customize the plain white letters, I sprayed them with a darker shade for contrast. Allow the letters to fully dry before arranging onto the pillow. Cover the letters with a cotton cloth and press with a hot iron for about 30 seconds. I ironed it again from the back of the fabric for another 30 seconds. I added an old button to the center of a burlap flower and used fabric glue to attach it to the corner of my pillow. Stuff it with a 12" pillow form and done! I picked up three 4" terra cotta rose pots at the craft store. Rose pots are a bit taller than regular terra cotta pots and are perfect for this craft. Paint the bottom of the pots tan and paint the top band in yellow with a 1" flat brush. 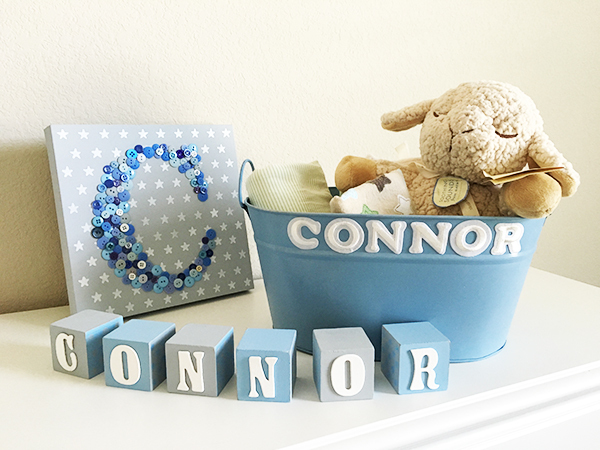 TIP: I prefer DecoArt Americana acrylic paints for this project because they have one-coat coverage and the colors matched the JOY Letters perfectly! YEA! Paint alternating thick (1/4" flat brush) and thin (#6 round brush) stripes in pink, green and blue. Accent with yellow polka dots, created by dipping the end of a paint brush handle in paint. Spell out the words FORKS, SPOONS and KNIVES with Joy embroidered letters, then glue around the band of each pot. 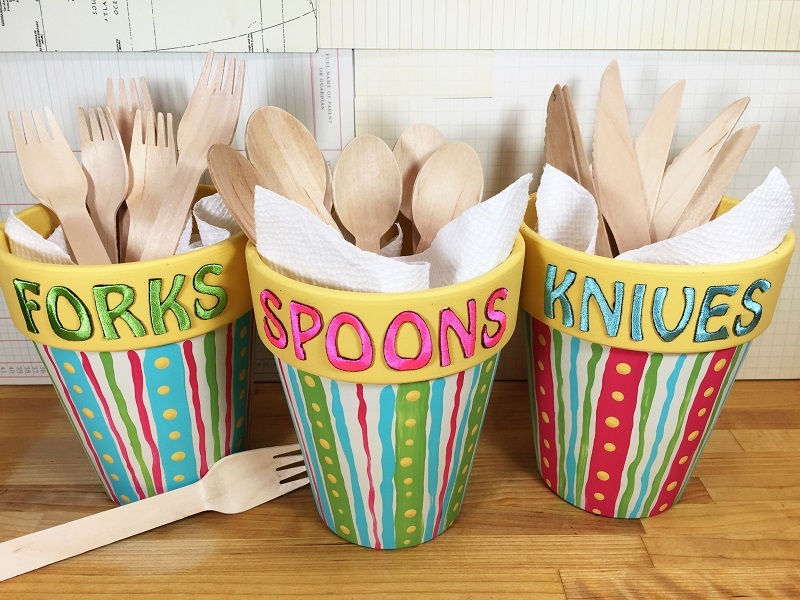 Just add cutlery and let the PARTY begin! 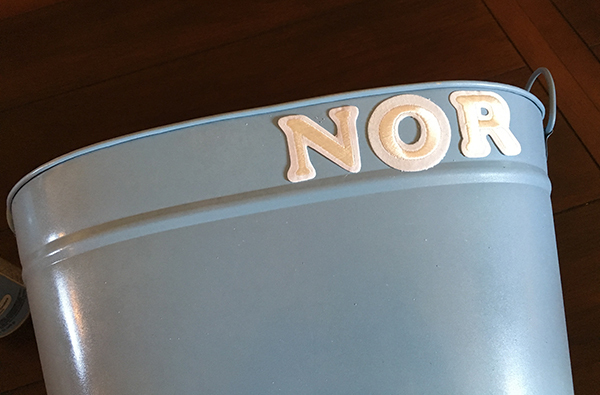 Customize your pots to your patio décor or party theme - the possibilities are endless because a wide variety of JOY letters are available at your local craft store! I recently took an online class with Seth Apter, a mixed media artist who specializes in creating unique painted surfaces by layering colors, stamps and stencils. I tried his techniques to make a peace flag on canvas - visit my blog to see how I put down each layer of paint. With Joy embroidered letters, I spelled the word that's always on my mind...peace. I toned down neon pink letters by dabbing a little tan and yellow paints on top with my finger before gluing them in place on the flag. Two of my very favorite things are traveling and scrapbooking. I am prone to making large, elaborate albums to document my journeys, but a few years ago I decided that I wanted something a little more concise to show ALL the trips I had been on. Something I could keep on my end table and just flip through when ever I wanted. So I started this little 6x8 travel journal where I make one little page for each trip that I have taken in my adult life. Cool, right? 1. Cut the paper to fit the spine of the album and draw faux stitching lines along each edge. 2. 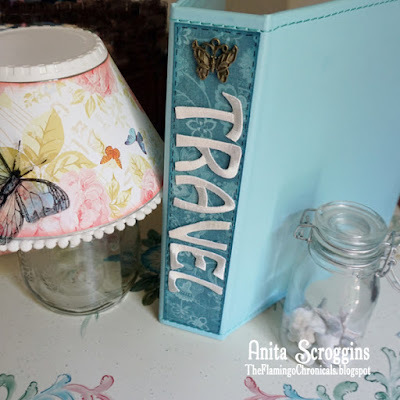 Add the letters with a lo-temp glue gun, then adhere the whole piece to the spine with double-sided tape. 3. Attach the metal embellishment. Joy letters are available in different sizes, fonts and colors at your local craft store! We have a wedding coming up this summer! On a recent trip to the craft store, I found everything I needed for the bride's bachelorette party. So far, we have a shirt made for the bride and maid of honor. Bridesmaids are to follow. The wedding colors are black, white and teal with a touch of metallic gold. The letters reflect the colors. These shirts are fun and easy to make. I am looking forward to some great photos from the party! 1. 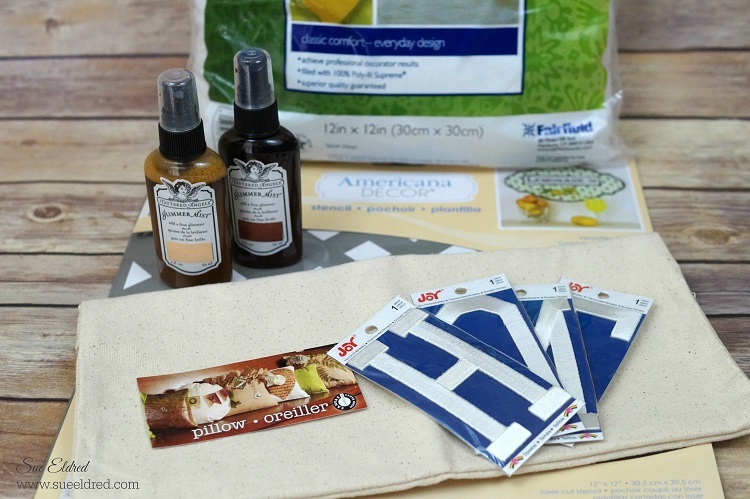 Read the instructions on the packaging for the embroidered letters before beginning your project. 2. Use a piece of masking tape to provide a straight line across the front of the tee shirt, then place the letters, spacing evenly. 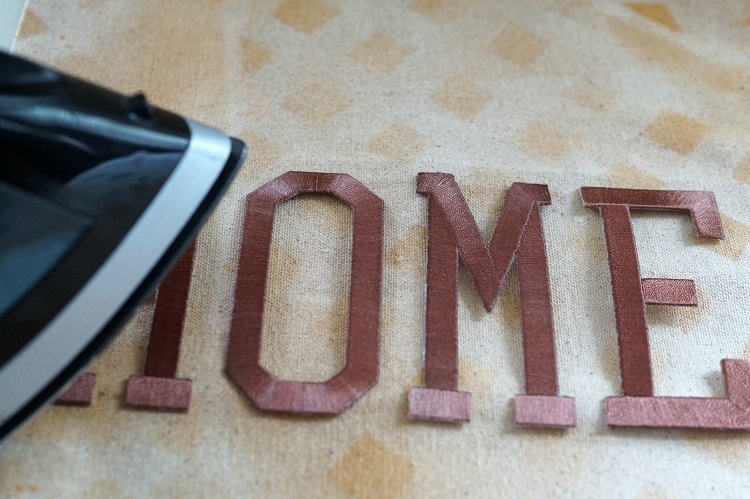 Add a small dot of fabric glue to the back of each letter to hold in place. Remove the tape before pressing. 3. Iron the letters in place as directed on the package. Reverse the tee shirt and press the letters from the wrong side of the fabric. Voilà! 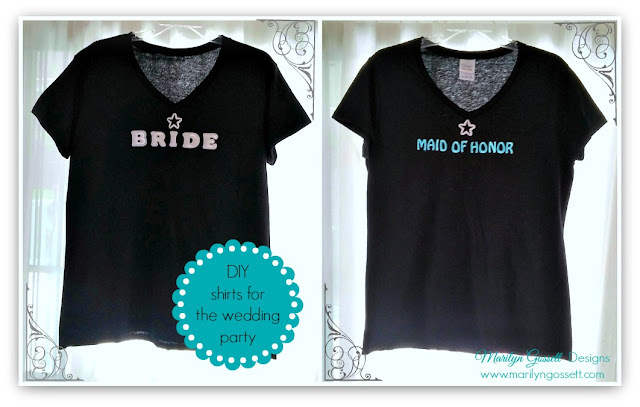 Now you have a cute tee for the bride and her maid of honor. You could also make one for the mother of the bride, each of the bridesmaids and anyone else in the wedding party - even the groom! 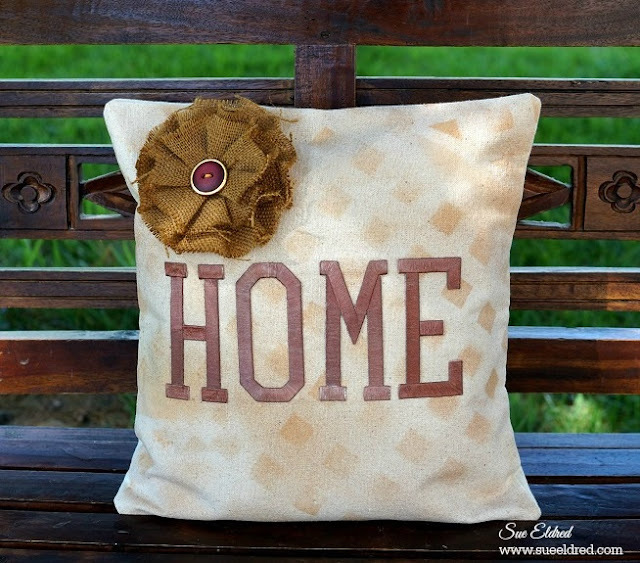 TIP: Joy embroidered letters are available in a variety of fonts and colors. If you don't see the color you need, letters can also be dyed with sprays (quick and easy), fabric markers or paint. 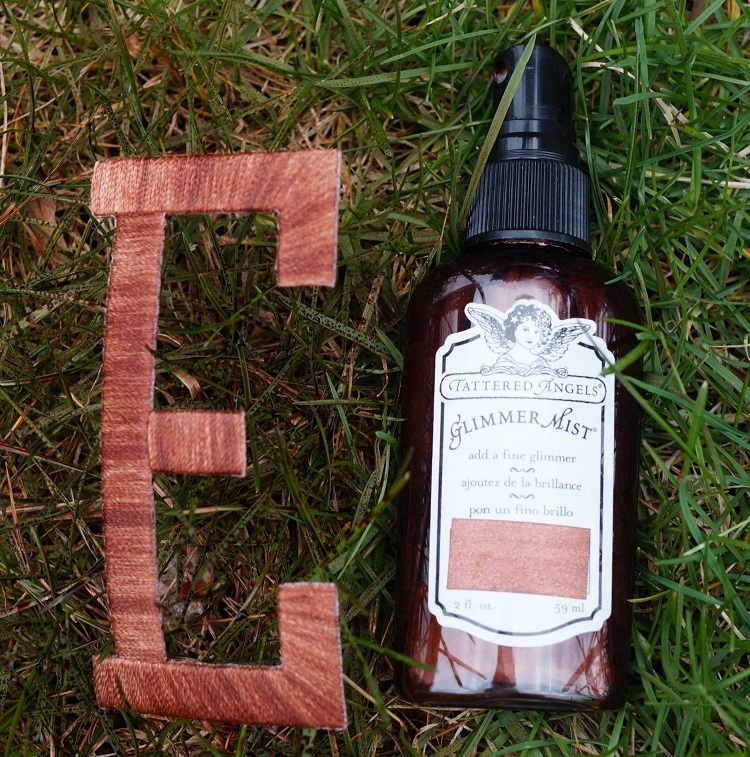 Summer is travel time, and a new luggage tag is easy to make with JOY Iron-on letters. 1. Cut two large tag shapes from heavy fabric (denim was used here from an old pair of blue jeans). 2. Sew or glue them together along the bottom and sides leaving the top open. I distressed the edges of the denim with scissors. 3. Iron on the letters following the manufacturer's instructions. I used two script sizes and overlapped them to create this monogram. 4. Cut a slit at the top of the tag through both layers for the tie. Insert a card with your personal information into the tag. Use twill tape or ribbon to tie it to your bag handle. I love to decorate birthday cakes and in this age of photo sharing, I'm constantly inspired. 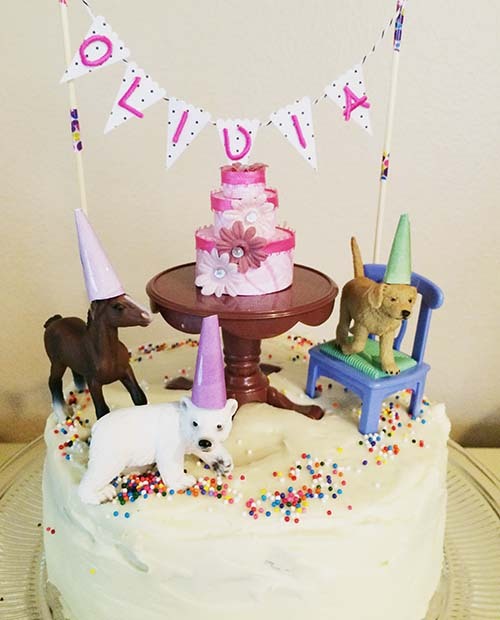 A year ago, I saw a birthday cake decorated with small, plastic toy animals and doll house furniture and I knew I wanted to make one for my daughter. In June, I was able to make it happen. 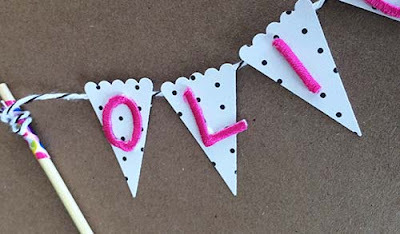 I used Joy Letters to create a special name banner to complete the miniature party. The banner made the top of the cake even cuter. 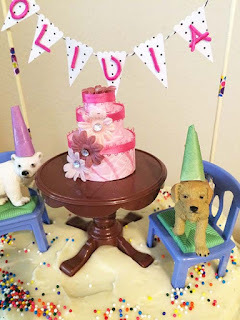 Even if you don't have dollhouse furniture or plastic animals, you can make the banner for a special cake topper. Die-cut, triangle banner shapes - No die? Just cut out small triangles! 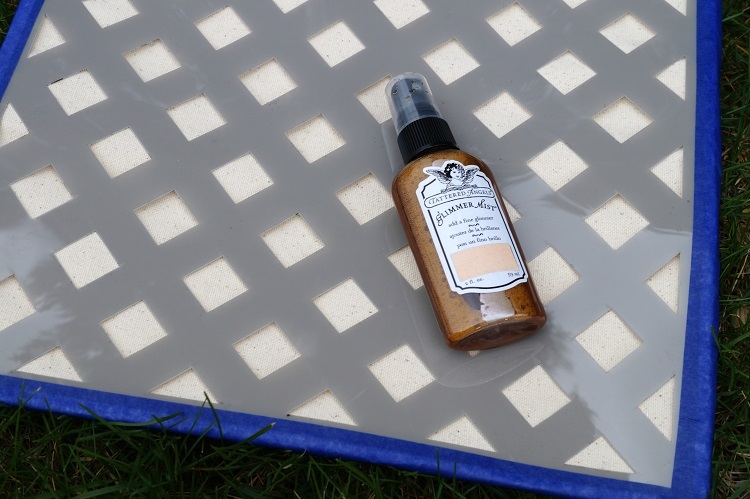 Glue the banner shapes onto a length of baker's twine. Make sure the twine is cut long enough to spell out the name or message you want, with a little extra to tie around the skewers. Decorate the wood skewers by wrapping them in washi tape. Tie the ends of the banner twine around each skewer. Push the skewers into the top of the your cake. Joy iron-on embroidered letters can be found at your local craft store!